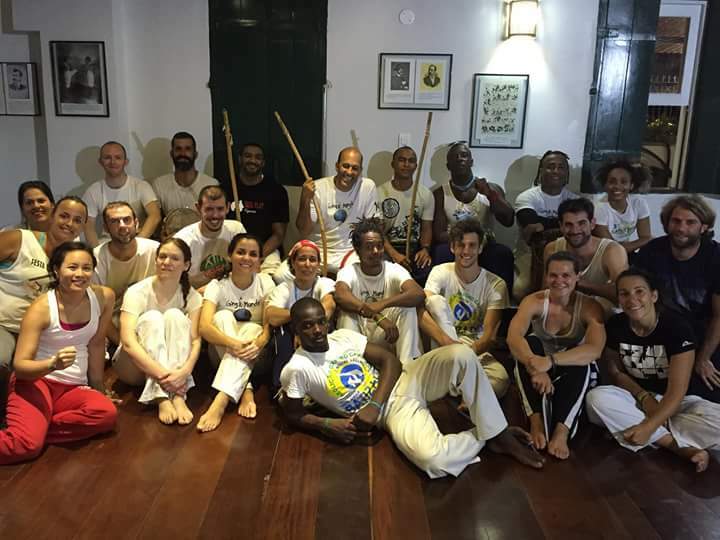 This summer I was fortunate enough to spend two and a half weeks in Salvador, Brasil on a trip with my Mestre Luis Negao and fellow capoeiristas from the Oxford, London and South Africa branches of our capoeira group – Abolicao. 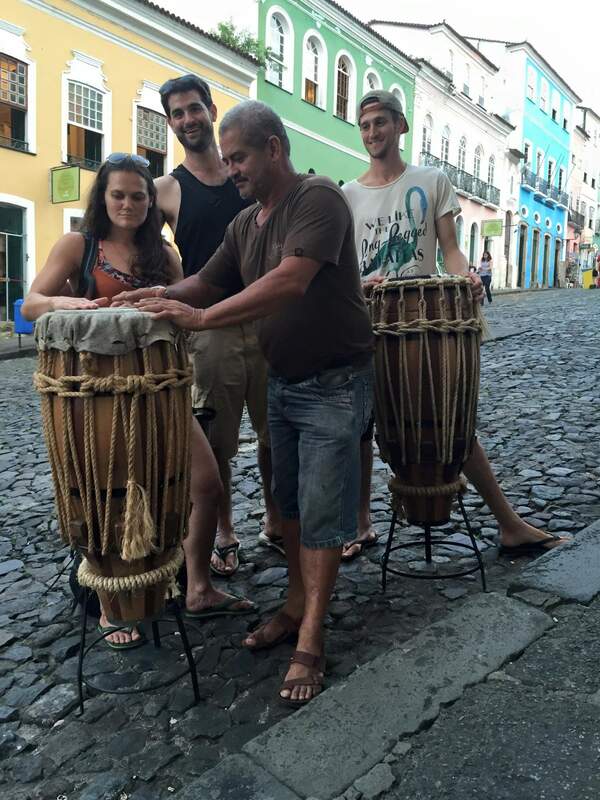 There is no way that I could possibly hope to describe everything that I learnt and everything that happened – it was a life changing trip both in terms of my capoeira and my outlook on life, but I will try and share a few things. My mestre is from Itapua on the outskirts of Salvador so we stayed in that area in a hotel owned by a friend of his, the Villa de Praia. Functional rooms, the hotel had wonderful sunny outdoor areas, a great breakfast buffet and restaurant, and was right on the beach so every day we could get comfortable on some of the coral and rock formations that lined the coast and collect some axe from the ocean. The staff took really good care of us and were funny and interesting, and by the end of the trip it really felt like home – we were sad to leave. I don’t think I will ever look at fruit the same. Being from Australia I am accustomed to good fresh fruit, which is impossible to get in the UK, but in Salvador it was available everywhere all the time – watermelon, papaya, pineapple. And they made amazing juice; pineapple with a dash of lime is amazing. There was also fresh coconut water on tap all the time – they just take them fresh off the trees and stick a straw in them. And lots of fruit I hadn’t even heard of, and frozen acai kind of sorbet! 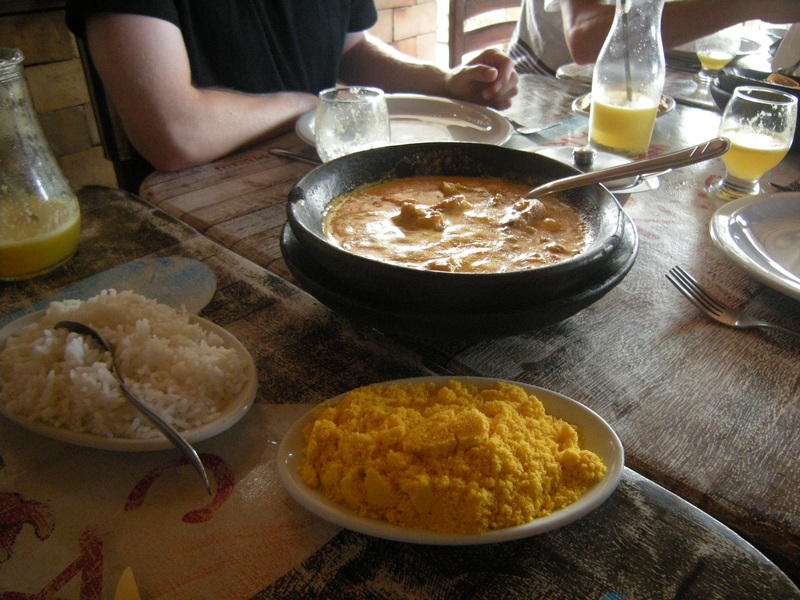 Being on the coast there was also a lot of great seafood, often served as a moqueca or some similar variation, so in a hot bowl and a kind of curry sauce – it was so good. 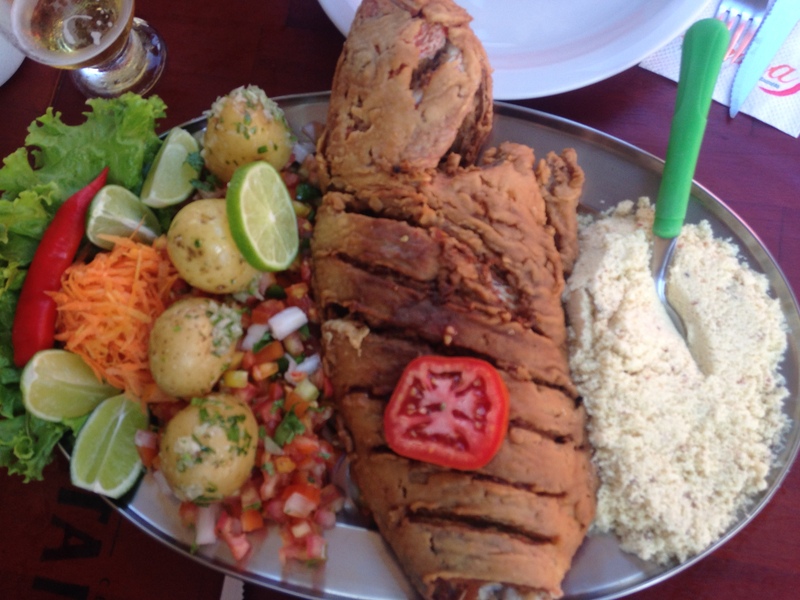 But a highlight was the Vermelha: a kind of big gold fish that is fried in a light batter. Nom, nom, nom. I also think I ate more steak in two weeks in Brasil than in the six months before! The breakfast. The hotel did an amazing breakfast buffet that really set you up for the day, but one thing which the other guys loved but I found highly disturbing – they eat cake for breakfast. Next to the scrambled eggs and the toast, five or six different cakes every morning that people just ate alongside the rest of their breakfast. Surreal. But we weren’t in Brasil for the food, we were there to train capeoira and get a feel for the history of the game and the modern culture that nourishes it? 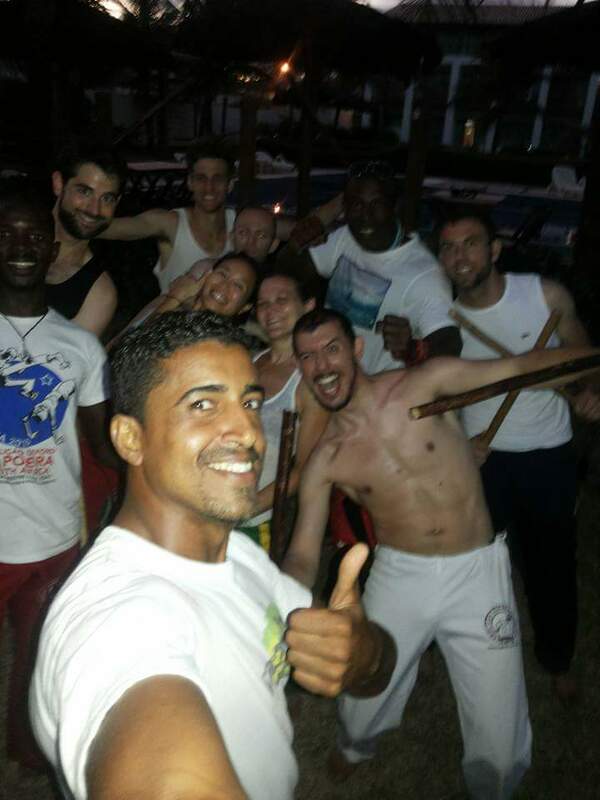 Every day either our mestre or a local teacher – often the amazing Professor Roupie – gave us a training session in the morning at the hotel, both keeping us fit and keeping our focus on capoeira. We also spent a lot of our down time together teaching one another new moves. Since we had capoeiristas from three different branches of our group that don’t get to play together that often there was a lot to learn from one another. But what was really amazing was visiting with all the mestres and getting a taste of how they play, learning from them, and stretching ourselves. Training with your own group and playing with the same people all the time it is easy to get into a routine, and also quite easy to predict what the people you are playing with will do – you need to challenge yourself with unexpected situations. In Itapua we visited Mestre Biriba and his group Vadiacao a few times – rodas with them top and tailed our trip in the most amazing way. 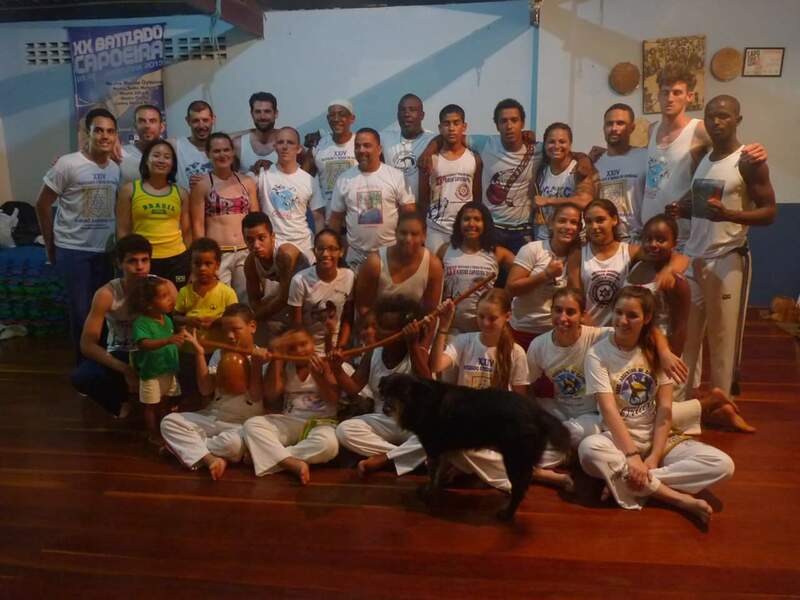 Vadiacao is a local project that uses capoeira to give kids an interest, keeping them out of trouble and motivating them, giving them something to work towards. 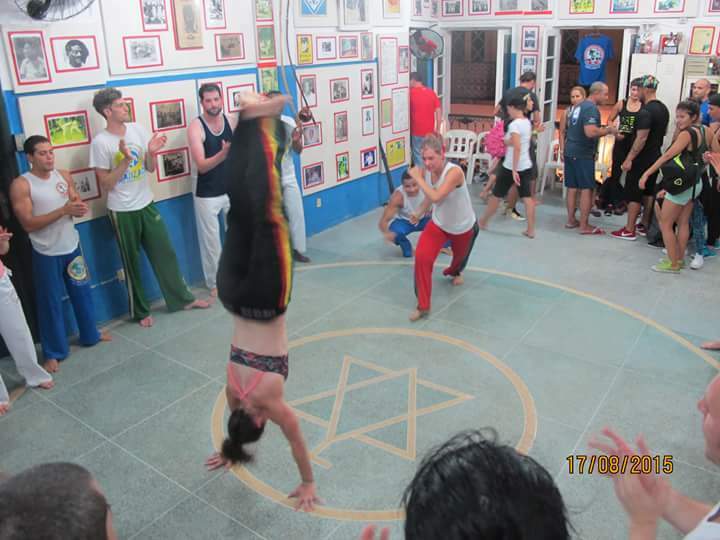 Among the adults, they had some amazing capoeiristas in their group, and their rodas were fast paced and had a huge energy – the whole room vibrated. They played a relatively aggressive game. In the UK I feel that games are often cooperative and we are very sensitive to not hurting our partner – the English cultural injection into capoeira – but here it was much more of a fight, with trickery and light contact, but they were a friendly and welcoming group. 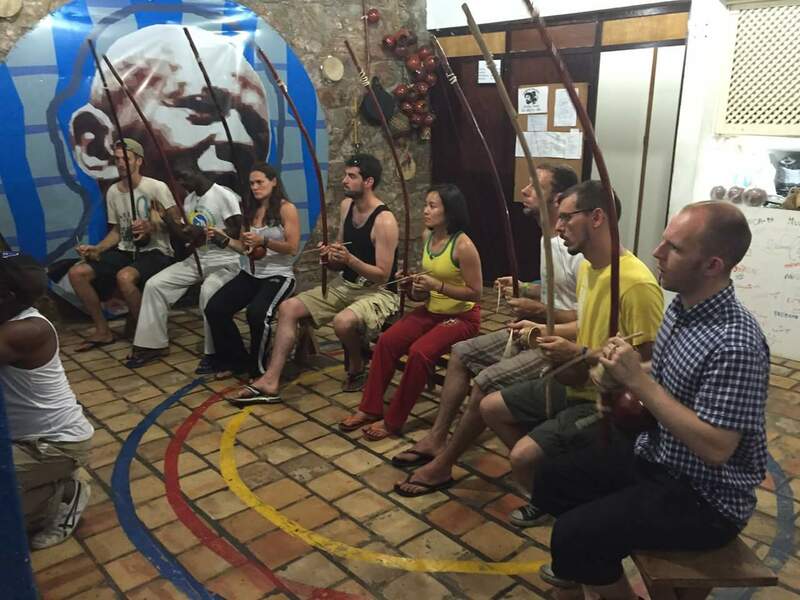 As well as playing with their group, one day one a professor from the group came and gave us a maculele workshop. They played excellent maculele the first time we visited them, but back in the UK we only really do it a few times a year on special occasions, so we were completely in awe and out of our depth. As well as being beautiful in its own right, training maculele is great for capoeira as there is a focus on engaging with your partner and developing your own style of movement. In Itapua we also trained with Mestre Neto Moska and his group, which is another project also aimed at local kids and which has a vibrant community around it. We did a training session with the kids and were then invited to join a roda with the group. I had a game with the amazing Professor Picolo that I really enjoyed – it was a benguela game that really flowed because he was such a fantastic and generous player. Shortly before we left we also played with Mestre Xareu (and old friend of Mestre Negao). It was more chilled out than the other local rodas, but although the group played friendly, their games were beautiful. It was an excellent chance to take stock of what we had learnt, and how much we have to work on to really apply what we had learnt throughout our trip to improve and transform our game. 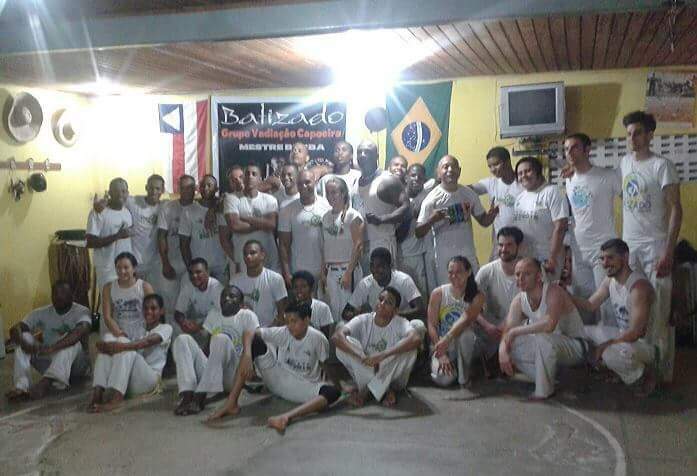 Of course we also made several trips to the Pelerinho in Salvador, the homeland of capoeira regional where Mestre Bimba established his school. 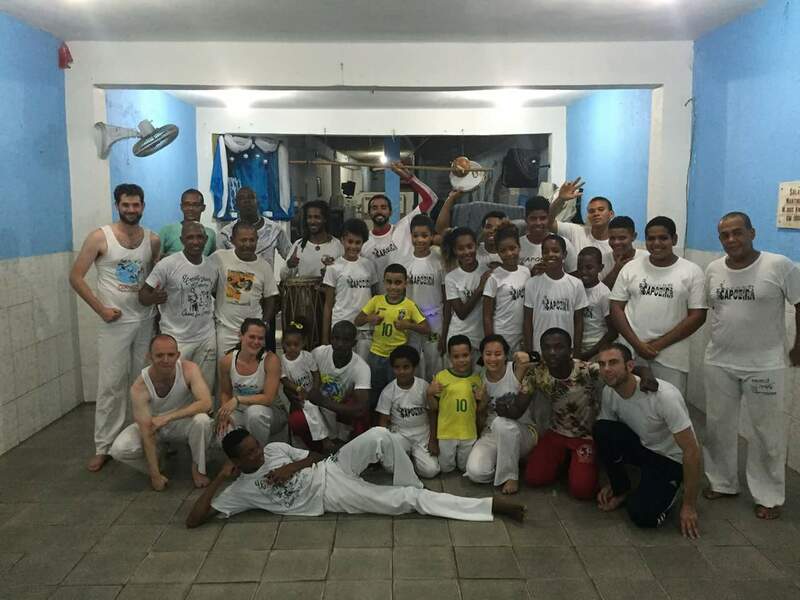 Our first trip was to Mestre Bimba’s academy where his son Mestre Bamba teaches – Associacao Capoeira de Mestre Bimba. We had a training session and a roda and again it was very high energy, soaking into your bones while you were watching and lifting you to do things that you didn’t know that you could while you were in the roda. It was a privilege to play in the very room where Mestre Bimba had taught, and where my own mestre had learnt as a young man, taking the long bus ride from Itapua regularly due to his love of the game. We also visited Mestre Nenel, another son of Mesre Bimba, at the Filhos de Bimba academy. We did a more low key training session and roda, but learnt a lot, particularly about following through and finishing your moves – not just going through the motions. A particular treat was that Mestre Cafune and Mestre Boinha were there, both students of Mestre Bimba who have played capoeira for over 50 years. They played with us all, and while they weren’t throwing back flips, they controlled the roda with their knowledge and skill, leading us into traps with ease. A huge privilege. 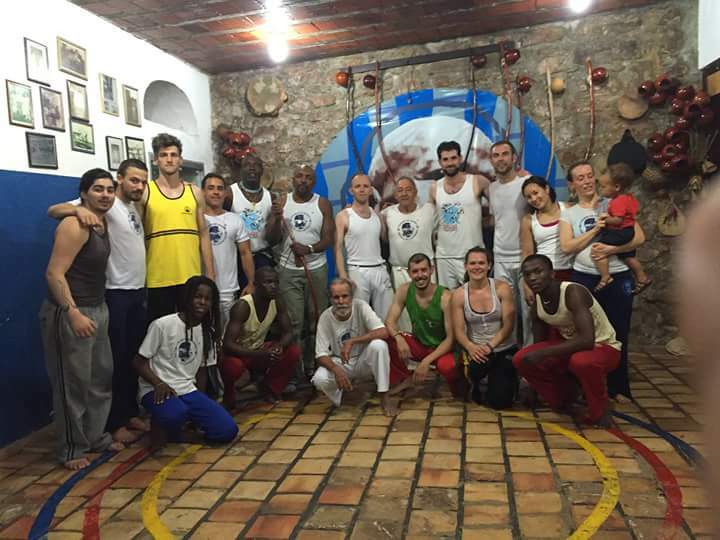 We trained with Mestre Sabia, Ginga Mundo, who my mestre thinks is one of the best current capoeiristas. We had a training session followed by a roda. They played an excellent ground game and really used their presence to control the roda – we picked up some amazing insights. I was so sad when we had to leave his new academy in the Pelerinho, I felt like we had not had enough time to spend with him and his students. Of course, as well as a place to train with the most famous mestres, the Pelerinho is the place to go capoeira shopping. We spent quite a bit of time in the Mercardo Modelo, the famous capoeira market in the lower city, and looking around the Pelerinho shops in the upper city (and had the fun of riding the lift). I expanded my already impressive collection of capoeira trousers and we spent a lot of time looking for instruments, especially a couple of atabaques that we needed for the groups. Everything was really good value, with trousers £3-5 and high quality drums for about £100. We got most of the instruments from a shop on the slope of the Pelerinho where the mestre gave us a lot of time, showing us how to play the instruments. I asked him how much to cut off his hands and take them with me, and I think he was really considering it (for my appreciation, not the money). 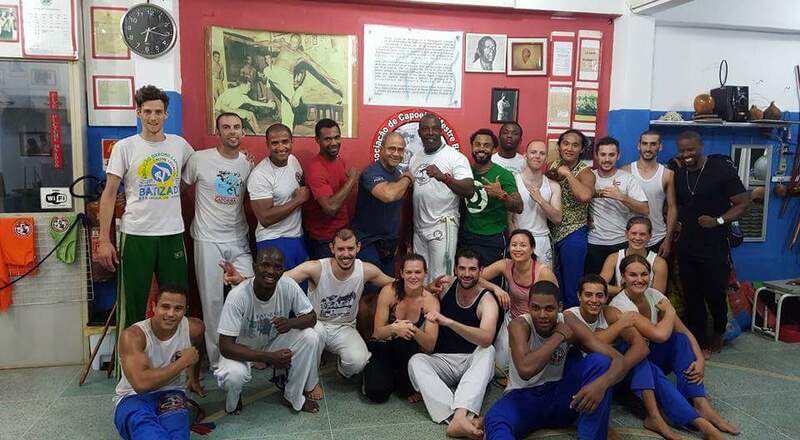 We also made our way to Arembepe to train with Mestre Orelha, the mestre of our mestre. His group was fantastic, again with really high energy, but also amazing malandragem. In capoeira malandragem is the art of trickery, tricking someone to to act so that you can catch them out with a take down or a reversal kick. Everyone in their group did this with amazing finesse. Sometimes I don’t think we focus enough on this in the UK, or at last I am not sure I do. You have to be careful though, it can be easy to overuse malangragem and disrupt the flow of the game. 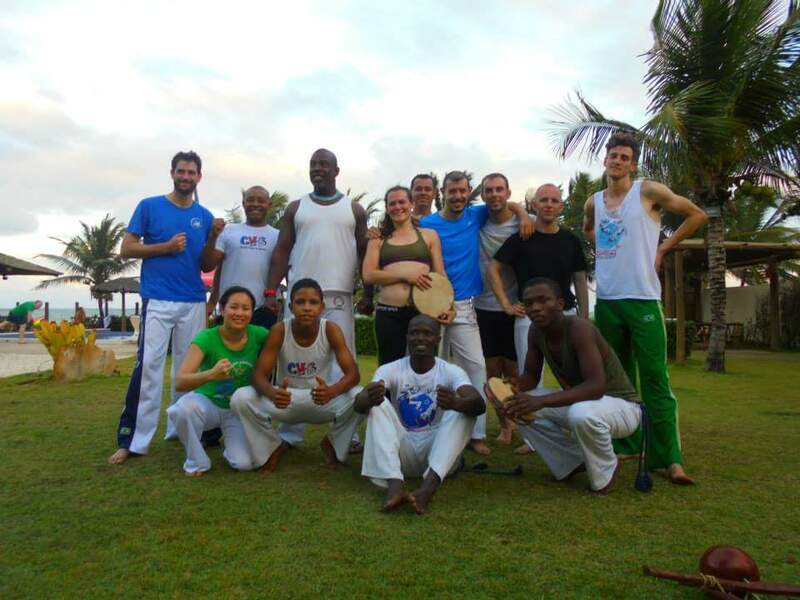 Arembepe was not just an experience for the capoeira – it is one of the most beautiful places on the planet. A small beach community (think Bondi but less touristy) the beach there is amazing. It is so blue, and about 30 metres out there are coral formations about 10 mestres wide, so within the formation the sea is calm for swimming, and waves sweep over the top of the coral creating little waterfalls. 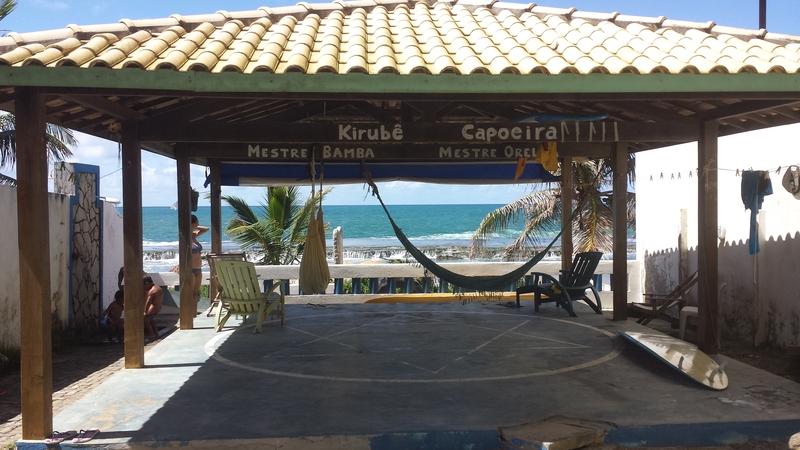 We visited Mestre Orelha’s house there which is right on the beach and my idea of paradise. Also, his wife cooked for us and she was an excellent vegan cook – her plantain muqueca was a revalation. Arembepe is also home to one of the last hippie villages from the Woodstock days. We walked there on our second day in the town and visited the house that Janet Joplin had lived in. I got into capoeira for the movement, which is still what speaks to me most, but music is such an important part of capoeira. It creates the atmosphere and puts you in the moment to be able to play with your partner – you both vibrate in time with the music which allows you to vibrate in time to one another and flow together. Once you start to delve into the music it can become a real passion. The trip was a great opportunity to focus on the music as we had a lot of time to devote to it and were able to give one another tips on how to play the instruments and teach one another new songs. 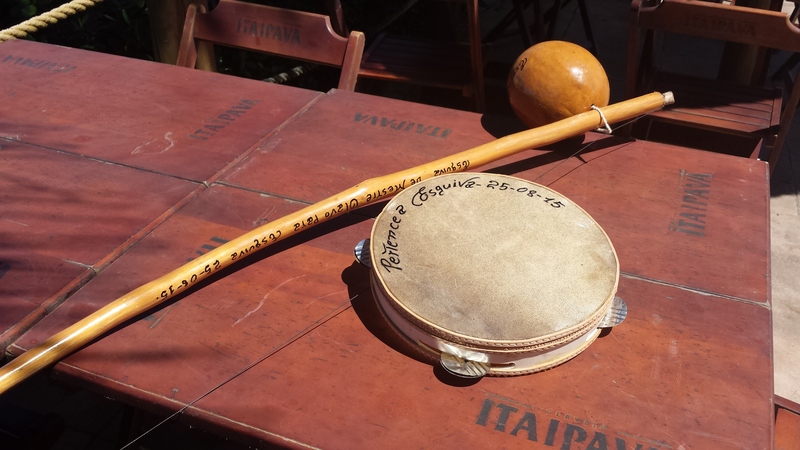 A singular privilege, Mestre Negao invited Mestre Olavo to see us and bring some instruments for us to try and buy. 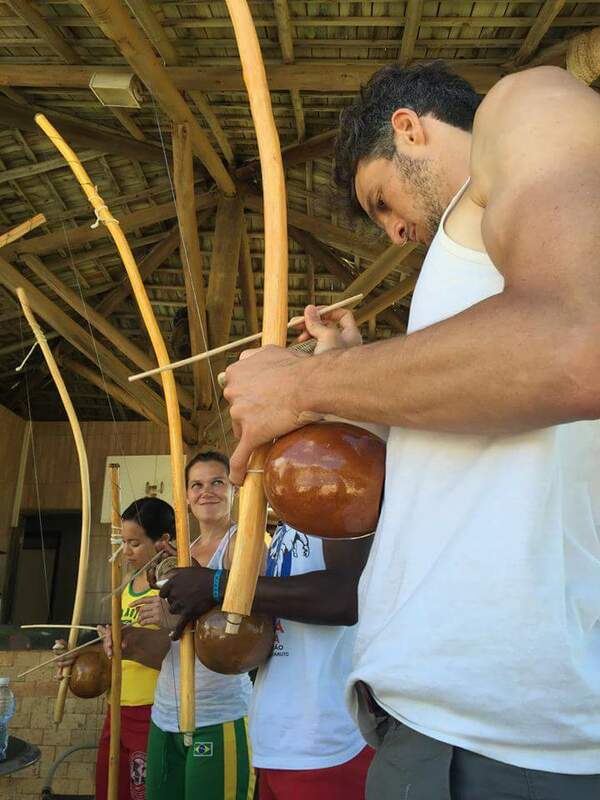 Mestre Olavo is the most famous berimbau maker and all the well known mestres get their berimbaus from him. They were wonderfully crafted, with each cabaca designed to fit perfectly with a specific biriba. He played for us, giving us some tips on playing and looking after our instruments, and signed all of our new instruments for us. Enthusiastic with our new instruments, Mestre Negao arranged for us to have a music workshop with Mestre Nenel. Mestre Nenel has a unique way of teaching which is both great for getting beginners to understand the various rhythms quickly, and allow more advanced players to pick up a lot of variations. We were only there for an hour, but I saw an immediate improvement in my playing and have improved a lot with practice over the weeks since the trip. This incomplete of ‘things that happened’ or ‘stuff we did’ can’t hope to even begin to capture what it was like on the trip. 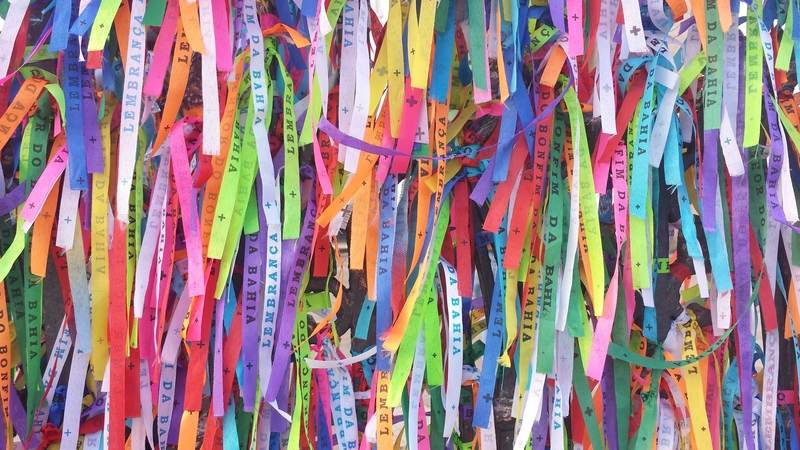 It was a cultural smorgasbord of tastes, sounds and sights – I haven’t even mentioned the amazing Olurum drummers in the streets of the Pelerinho! 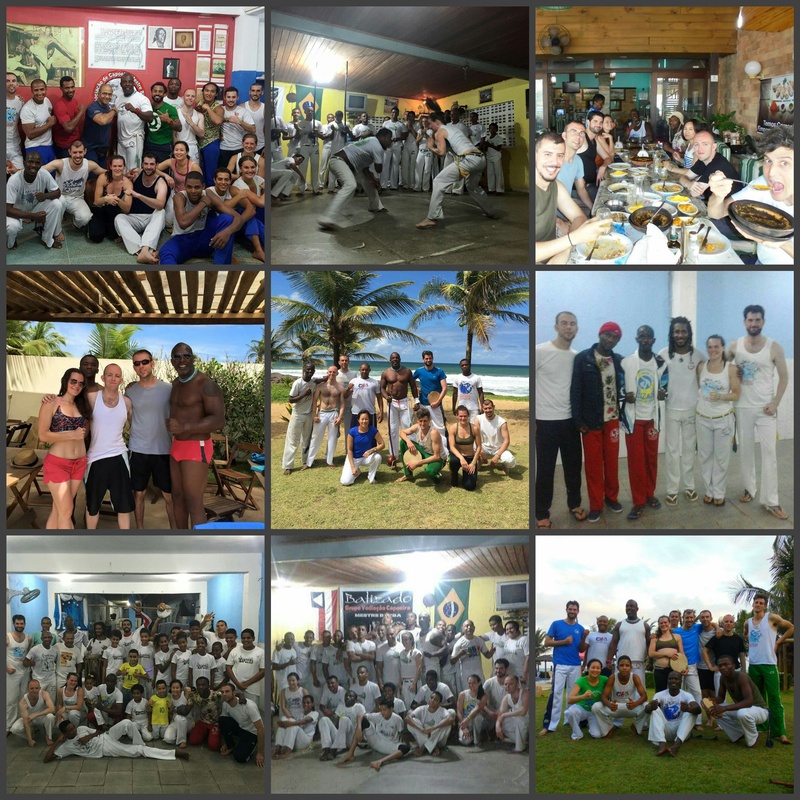 The freedom and energy of being able to eat, sleep and breathe capoeira for more than two weeks. And getting to spend a lot of quality time with like minded people who are now good friends. Not to mention the freedom and perspective of being able to take a good chunk of time out of your life, for me both time out of my job and my day to day, since unlike most trips I did not travel with my husband. It’s not that I have necessarily come back and made lots of changes in my life – I’m lucky that I really love my job and am super content with the life I have built – but it has reiterated for me to do what you love and invest time in what makes you happy, and don’t waste time with what isn’t important to you and not sweat the small stuff. But more than that, sometimes things are going well, so you don’t invest time in them because it is like they are looking after themselves, but often this is the time to really invest in those important things. For me that includes capoeira as it brings me so much joy through the challenge, the movement, the music and the energy, but also the community that exists around it, my community. I will certainly be upping investment in my capoeira in the coming months and years (and hopefully decade). 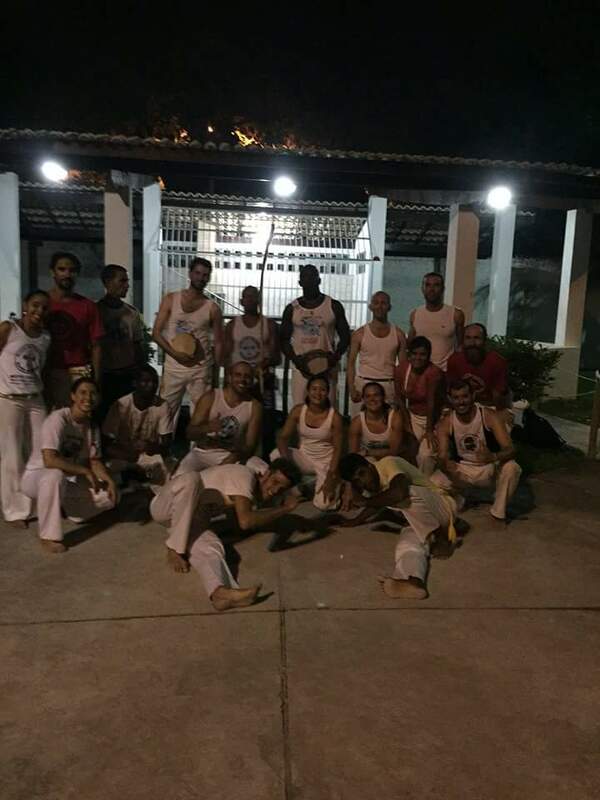 This entry was posted on October 4, 2015 by Jessica Suess in Capoeira and tagged bahia, berimbau, brasil, brazil, capoeira, itapua, maculele, regional, Salvador.